We had a fantastic welcome in London on Saturday, a fitting and rewarding end to our great adventure. There were over a hundred riders who set off with us from Savill Gardens in Windsor Great Park. 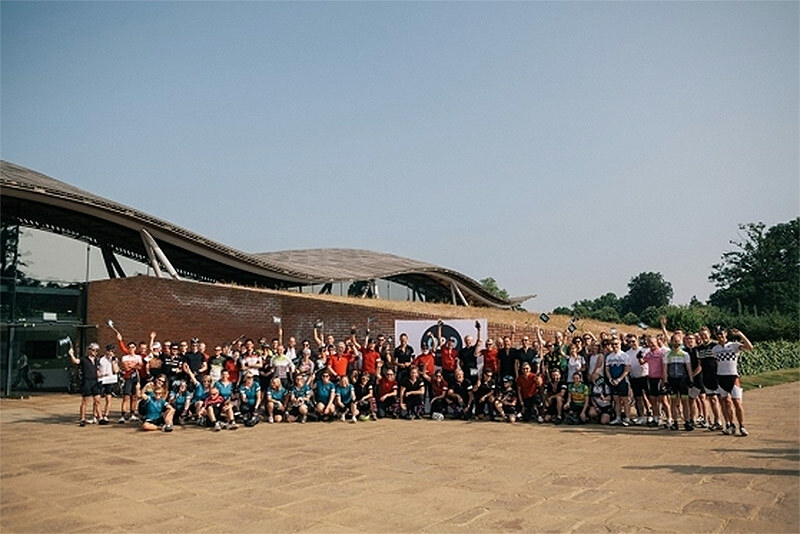 The weather was fair and The Crown Estate kindly provided coffees and bacon butties for everyone, served from the elegant gridshell of the Savill Building designed by Glenn Howells. I had selected this as our starting point for the ride into London because, not only did it provide a good meeting point at a reasonable distance from Portland Place, but back in 2005 I organised the design competition for the building—and was pleased to see it maturing so beautifully, the green oak sourced from the Royal Park now sporting a rich grey patina with the warping slats adding to its rustic air. 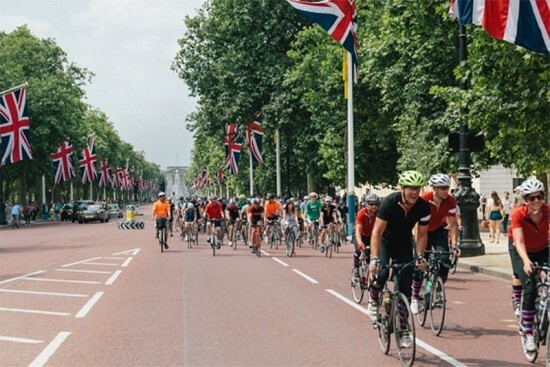 Riding with such a big group into London is a major logistical and herding exercise—the riders were of a wide variety of skills and the peloton spread out at times to several hundred metres. Luckily we were able to call on the skills of Nick Hanmer, the Chief Executive of Cycle to Cannes (C2C). He and his four motor cycle outriders skillfully brought the riders into The Mall in one bunch, a phenomenal achievement. I was especially pleased because I started C2C nearly ten years ago and Nick has brought great professionalism to its organisation and safety as well as expanding the number of rides the team organises and supports. Riding up The Mall—lined with clapping tourists and union flags—was very special; we rounded Trafalgar Square and pedalled into Waterloo Place where we met up with more riders including Lord Richard Rogers (on a Brompton), Sir Terry Farrell, RIBA President Angela Brady, Rab Bennetts, Robin Nicholson, and Sunand Prasad. Then on up Regent Street to our final destination: Portland Place and the RIBA building! There was an unexpectedly large group of friends and relatives outside the RIBA. Angela Brady opened a couple of bottles of champagne and welcomed us to the Institute. But we weren’t able to hold our final arrival in the RIBA building because it had been hired out for a wedding and a bunch of sweaty cyclists would not have been welcome guests. So we moved on to the New London Architecture Centre (NLA) on Store Street where we were able to party in the newly pedestrianised crescent space. Now we could relax, chat to the riders who joined us for the day as well as discuss our achievements together. We had met up with Angela in Ireland—she joined us when we arrived in Shannon from New York—and proved a wonderful host to the Emerald Isle. Then ex-RIBA President and now Mayor of Bristol, George Ferguson, met us at the Severn Bridge and rode with us under the Clifton Suspension Bridge and into the city where AHMM put on a party for us in the Architecture Centre. It was a great end to a great adventure. 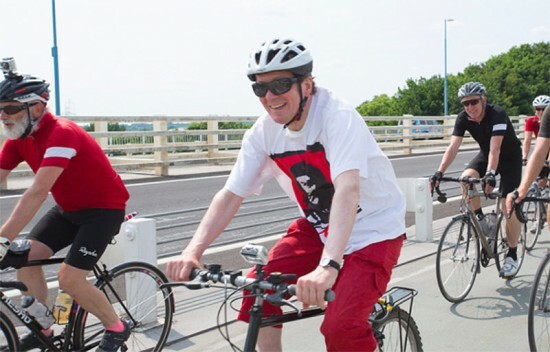 I was particularly pleased that my four children were able to ride in with me—Sophie, William and Alice on bikes, and Rupert, who is making a documentary of the ride,on the back of a motor bike with camera. Everybody asks—how do I feel now that it’s over? I feel relief and satisfaction that we got everyone home in one piece and we had no serious accidents; I feel enriched by the places I have seen and the people I’ve met; I feel strong and fit and pleased at my physical performance; and I look forward to using the huge amount of information we have amassed about cycling in cities to promote better cycling conditions generally. Finally I am very grateful for all those that have supported the ride—our main sponsors and the many, many contributors. Once we have done the sums I will let you know the total amount we have raised. What next? I’m cycling in the RideLondon event on August 4—a 100 miles sportif from the Olympic Park to the Surrey Hills and back—so I will be keeping in shape for that—and I will get myself a shave! I need to get back into the swing of things at the NLA where the fantastic staff have been covering for me over the last two and a half months. I am very grateful to them too.